Here the result of a good collaboration between KMFAP & Femeraid Netherlands. Larissa starts the adventure with a new pilot: the 20-year-old Imke Brommer. This third-year business economics blind student was not so long ago a more than deserving skater. Specializing in the 1000 and 1500 meters, she was already second in the Netherlands as a junior. However, she also proved to be able to cycle very hard and since last year she has been part of the National Talent Selection of the NOC * NSF in track cycling. National coach Eelke van der Wal saw a promising combination in Larissa and Imke and brought the two together. 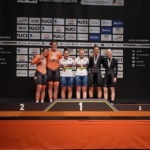 Larissa and Imke won silver for the second time on Sunday 13 January 2019 in Manchester at the World Cup track cycling competitions. After the silver in the one kilometer, the two on the tandem now also took the silver in the sprint. On Sunday the 17th 2019 she took bronze in the 200 meter sprint. 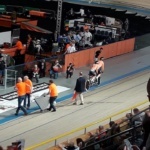 Larissa and Imke successfully participated in the Paracycling World Championships in Apeldoorn during the weekend of 16 and 17 March 2019. In the battle for bronze, they had to compete against the Belgian tandem team Griet Hoet and Anneleen Monsieur. In the very last meters Larissa and Imke managed to beat the Belgian team. Here too the gold went to the English duo Sophie Thornhill and Scott Helen, which so far seems unbeatable. Larissa nevertheless expressed the hope that she and Imke would be able to beat the English at the Paralympic Games that will be held in Tokyo in 2020 .